Often your business process have different ways, how they could be executed. To handle this, you should take care, that these process variants are documented in your central solution documentation. To do so, there is simple way in SAP Solution Manager 7.2 which helps you to manage the documentation and the lifecycle for the entire business processes. With SAP Solution Manager 7.2 Process Management SAP has delivered a powerful tool to manage business processes. Once you have defined your process structure, you can now decide, where you have process variants and document them. The following illustration shows the master process and two process variants, which are documented in the elements area at the bottom. For each process variant there is a seperate tab, where you can add your documentation, process diagramms, or specific test cases. Because Process Management is well integrated with Test Management, it is easy for the Test Manager, who is responsible to create a test plan to see the process variants while he is selecting the test scope. This makes it possible to create test packages for each process variant, which could be executed by several testers. Because of the seemless integration between Process Management and Test Management it is simple to define, document and test business processes with SAP Solution Manager 7.2. A naming convention for the process structure and also for the documents helps to orientate user during browsing to the process structure. Use attributes to mark processes, process steps or documents to use the powerful filters. 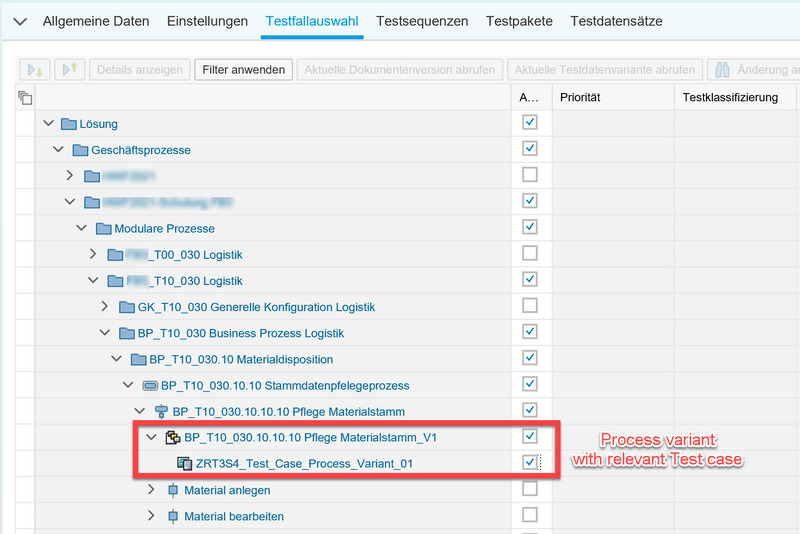 Hope this explains, how to handle process variants in SAP Solution Manager 7.2 and help you to manage the lifecycle of your business processes.